Lets talk about eyeliner application tips. Beautiful eyes need beautiful definition. Best way to provide that definition is by highlighting them. Amongst many methods of highlighting, eyeliner is the most potent and ‘easily done’ method with low recurring costs. It gives shapes to the eyes and adds importance as well. Problem lies in the art of application of eyeliner. It is considered as an easy thing to do, so many women make mistakes while applying it. There are a few who do it well, but there is a difference in professional application and an amateur job. This article will provide an insight into how to apply eyeliner. This is covered in following steps. 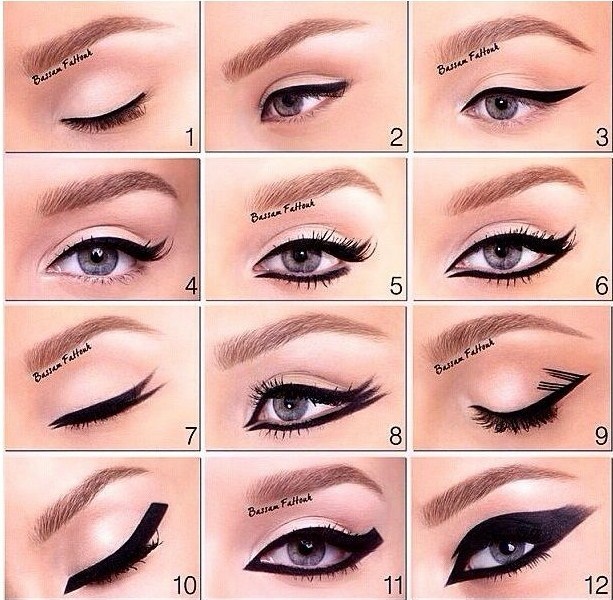 It is important to understand and choose the type of eyeliner that will enhance your beautiful eyes. Right type of eyeliner should be an essential item in the make-up bag. Amongst many varieties available like Cake eyeliner, Liquid eyeliner and pencil type, choose wisely to enhance the beauty of your eyes. Besides choosing the correct type, correct application is a must. Liquid eyeliner should be applied above eyelashes. Liquid type eyeliner requires great precision while applying, as it is quite similar to ink. You must take care to keep your eyes closed while the liquid is drying. Other type of eyeliner is pencil type, also known as Eyeliner pencil. This is applied below eyelashes on lower eyelids. Care must be taken to apply it in a thin line to accentuate the boundary of eyes subtly. On the other hand, a thick line will make your eyes look unnatural and harsh. Should there be a problem in applying a thin line, use a brush to smoothen and blend it. Application should be started at inner corner of the eye. Since eyes are delicate and very sensitive, use a light hand during application. Results can be unpredictable if eyeliner is applied in a hurry and without any care. Patience and a deft touch will give you great looking eyes. Eyeliner application should follow application of eye shadow. Reversing the procedure will hide the eyeliner and create smudges in eye shadow as well. Best impressions are achieved by combination of various enhancements. Try this one! 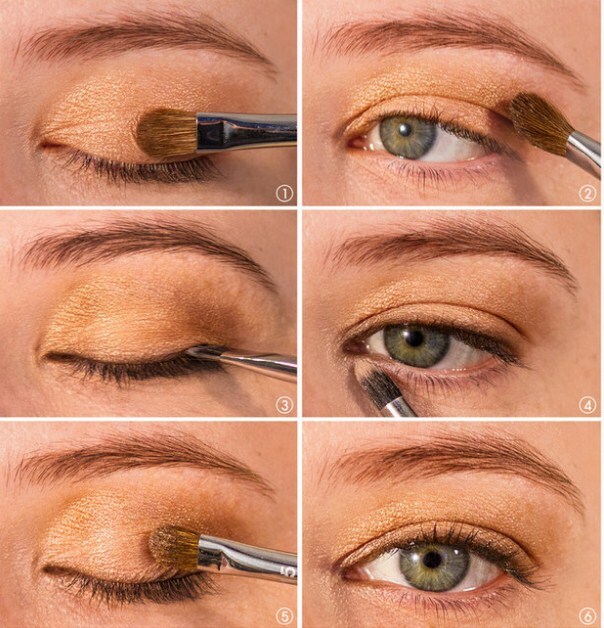 Use a color kohl pencil application above and below the eyelashes. This can be followed by dark grey or black liquid eyeliner application on top eyelashes. 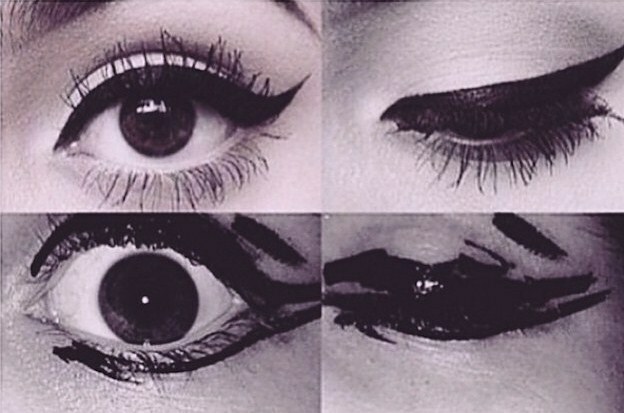 This simple method will make your eyes look quite intense and meaningful. Best part about this method is that it will stay the whole day. Dark liquid used on the color kohl will make your eyes stand out with a deep meaningful look. Eyeliner is applied easily if eyelids are taut. You can achieve this by tilting your head back while looking at yourself in the mirror, keeping eyes focussed on your face. Taut eyelids will provide for a deft touch. Secret to making your eyes look great is to enhance your eyelashes. This is achieved by lightly applying a dark eye shadow under eyelashes with a small make-up brush. 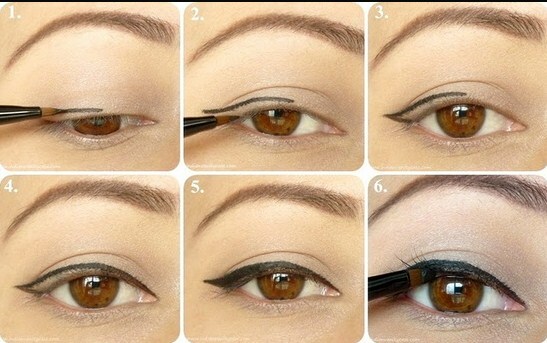 Follow this up with the eyeliner of your choice to achieve the look of full and fluttery eyelashes. Applying a thin line of lighter shade below the dark eyeliner further enhances this and makes your eyes look bigger and brighter. There is no restriction on using pencil type eyeliner on upper or lower eyelashes. But, if liquid eyeliner has to be applied, it must be applied on the top lid. Cake eyeliners, used with water, can be applied on either of lids. Green eyes can be easily accentuated with violet eyeliner. If you have noticed the color wheel, you will find that violet and green are opposite to each other and thus complement each other well. So use violet eyeliner if you have green eyes. Colors should be chosen depending upon the current season. For example, during autumn, green, beige and burnt orange colors will look very natural. Eyeliner pencil has one other use. If you ever think about giving shape and attitude to your lips, eyeliner is your weapon of choice. Use eyeliner for giving a shape to your lips and then use lipstick to further enhance them. Care must be taken to use eyeliner color that complements the color of your lipstick.